​OF EXPERIENCE in all facets of water bores and associated pumping equipment. Town & Country Drilling Services has been in operation for over 15 years specialising in the drilling of Water Supply Bores, Dewatering, installation of Groundwater Monitoring Wells, Earth Stake Installation, Geothermal Ground Loops and the supply and installation of submersible pumps and control systems throughout South Australia. ​With the difficulty in obtaining permits for construction of new water bores in Adelaide our expertise is being focused on maximising the potential of existing water bores. The 4WD field service vehicle is equipped with the necessary tools and testing equipment and a 500kg crane to lift small pumps from tanks, bores, sumps and wells. ​The custom built Pump Service Rig, a Maxilift Cobra crane mounted on a Mitsubishi Canter 4×4 truck is capable of lifting 3,000 kg to 8.5 metres enabling the safe handling of larger pumps and servicing of submersible pumps on steel pump column. Based in the Adelaide Hills, close to the McLaren Vale wine region and the Fleurieu Peninsula we are now focussing on the submersible pump side of the business. The slight shift of focus enables us to better respond to our customers requirements in a timely and efficient manner. The Drilling Rig is currently stood down and we are not undertaking the drilling of new water bores. Drilling rig not currently being operated to drill water bores. SPECIALISTS IN SUBMERSIBLE WATER BORE PUMPS. Fitter & Machinist Trade, Advanced Certificate in Hydraulics with 30+ years of experience in pumps, air compressors, valves and control systems. National Class 2 Water Well Drillers Licence. Franklin Electric Pump School qualified. Check out this Youtube video samthedriller posted. Submersible pump "How to Guide" available from-Waterborepump Warehouse. 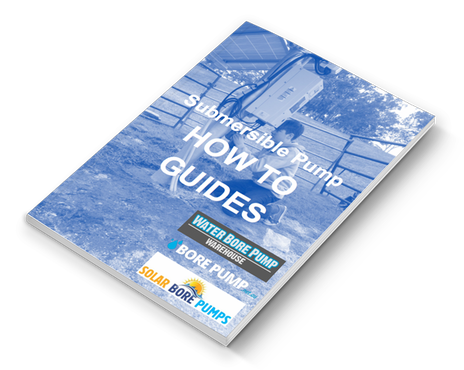 The guide contains information on how to choose the best submersible pump to suit your application and how to adjust the controls and switches on a new or existing pump installation. ​The fault finding guide is also included to assist with finding the problem and it’s possible cause.